Our product range includes a wide range of brass peacock inauguration lamp, peacock inauguration lamp and ritual brass items. We offer high quality and Lusturous pieces of Brass Peacock Lamps which are used for Inaugration and other purposes. 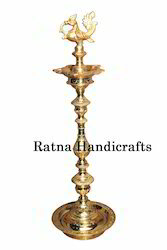 Inauguration Lamp for lighting made in brass metal. High quality item. The product is export quality. We Swethamber Arts are the leading whole salers manufactures, retailers, distributers in beautiful brass and bronze handicrafts. We serve our clients with a quality range of Brass Items, which is appreciated for its long lasting features. These items are at par with the international quality standards and are available in variety of patterns & designs.